Magento Banner Pro extension is a perfect tool to attract customers by launching outstanding marketing campaigns. Build multiple promos, analyze the efficiency of each banner and enjoy your conversion rates grow. Create and manage banner ads in numerous locations. Evaluate effectiveness of each particular marketing campaign. Run ads that convert! Compare the performance of different banners by running simple A/B tests. Banner Pro is a Magento 1 extension designed to help marketing specialists to manage their advertising campaigns. With this Magento banner module you will be given numerous options in defining the structure, design and target audience of each marketing campaign. The extension supports multiple banner types including Magento banner slider, image banner and html banner. In addition, built-in performance comparison graphs are also included for you to quickly analyze the efficiency of each particular marketing campaign. Universal banner management tool for online businesses of any size. Create and manage your own banner advertising network for any marketing campaign on your Magento store.. Banner ads can be displayed in numerous locations, including: Magento stores, blogs, email newsletters, social networks or any other website. Simply copy & paste the auto-generated Ad code for your marketing campaign and start tracking clicks from all sources in one place! Built-in performance comparison graphs allows you to quickly analyze the efficiency of each particular marketing campaign. View clicks, impressions, click-through rates (CTR) by period for each banner individually or banner group and campaign as a whole. Magento Banner Pro statistics helps to run simple A/B tests (also known as split tests) and choose the most successful Campaign, Banner Group or Banner. Compare performance of different banner designs, page locations or marketing channels, apply necessary changes and enjoy high conversion rates. Supported banner types are: Magento banner slider, image banner and html banner. Magento banner slider allows you to display multiple image banners within the same placeholder. With HTML banner type you can create your own interactive banner Ad to attract visitor’s attention. Display your banner ads in a number of the built-in placeholder locations: sidebars, header, footer, product’s info, etc. Use auto-generated code to display banners in any custom location, such as CMS page content, theme PHTML file or any external website (wordpress blogs, drupal cms or any other website or platform). Save your time with the quick banner management interface that uses AJAX technology to allow saving changes without page reloads. Visually intuitive interface combines marketing campaign tree with multiple filters, graphs and statistics for easy banner management. Magento Banner Pro was designed to work flawlessly on any third party Magento theme. Whether it is your own custom theme or a popular theme like Ultimo, Shopper, Fortis, etc. – it supports them all. NEW! Added ability to select store pages and categories using Magento rules to specify where banners should be displayed. Professional Banner manager extension for Magento allows you to create and manage your own banner advertising network for any marketing campaign at your Magento store. Each marketing campaign is based of banner groups and banners. Banner groups allows you to group similar banners in one collection for easy A/B testing and comparison. Assign Banner Groups to different store views and customer groups. Track clicks, conversion rates and impressions for each banner individually or banner group and campaign as a whole. Magento Banner Pro module comes with built-in performance comparison graphs for easy visualization of clicks, impressions and click-through rates (CTR) by period. Admin can create an unlimited number of banners, banner groups, campaigns and placeholders. Admin can use existing or create their own custom placeholders (banner placement locations) allowing them to display banners anywhere on their Magento store. Such locations include, but not limited to: sidebars, header, footer, product info, etc. Banners can be also displayed on any other third party websites, platforms or newsletter campaigns. Whether it’s a Wordpress Blog, Drupal site or any other custom website - it supports them all. Admin can create different marketing banner campaigns for a specified amount of time or without time restriction. Additionally they can be started/paused manually at any time. User-friendly banner management interface using AJAX technology allowing you to make changes without page reloads. Multiple banner types are supported, such as Magento banner slider, image banner and html banner. If multiple banners are placed in the same location at the same time, they will be displayed in the form of Magento slider or banner rotator widget. Admin can disable statistic tracking by IP address. 100% open code Magento extension. Plumrocket’s support was top notch! My magetno knowledge is not deep thus some help was needed. Their support manager has explained everything I was confused about. A wonderful extension that makes our store more engaging and dynamic . My biggest thanks to your team! I would definitely recommend this extension to advertise properly on your website. It is easy to get it working with very little time to spend to get it working. I did not have to ask for Plurmrocket support as it worked right away after installation. Additionally, the statistics report functionality is really great to monitor the efficiency of your campaigns. I definitely recommend this extension as one of the best on the market. Chose this extension as we considered it to be best in class for our new Magento site and it does what we asked for. Great support provided and in timely manner. We were looking for a way to manage banners on our homepage, and this extension works nicely. We can setup campaigns for different times of the year and have them activate at the right time. It also allows you to easily change banners across multiple pages if needed to. It would be nice if there were more placeholders with the extension, particularly the homepage, as well as different size types. Also it would be great if the extension could also display products from assigned categories to show featured products and best sellers etc. Hopefully a future update will have these very useful features. Thanks for your splendid review, we really value your positive input! As for the features you noted: 1) The ability for store owner to create custom placeholders, and place them anywhere on the page is already included with Banner Pro (if you're familiar with Magento CMS and widgets technology). Note that all possible Magento RWD layout locations are supported with this extension. 2) In terms of products display - we are thankful for suggestion, but would like to point out that the primary purpose of the Banner Pro is to serve as a banner marketing tool. It allows you to configure the banner ads in multiple locations (including third party websites), create banner campaigns and schedule them as required, do the A/B testing and alike. In this context, showing up the products will be somewhat out of scope feature, that is not in line with what our banner extension does. Yet, our skilled developers can do any kind of customizations to your Magento, just let us know! This is a really good banner extension if you own a magento store. First of all I would like to say that they have an amazing technical support. We have purchased several extensions from Plumrocket and all of them are great. Regarding Banner Pro - it is a very useful one! It has statistics of impressions and clicks, and that's exactly what we needed! Thank you Plumrocket developers! I'm extremely happy with this extension. It works as described. I had some questions while configuring it and Plumrocket team resolved all of them very quickly. I recommend it! It's a very nice module. At first, it was bit complex to understand how to set it up, but their support manager gave me a link to documentation guide. After reading the guide it was easy to configure and manage it. 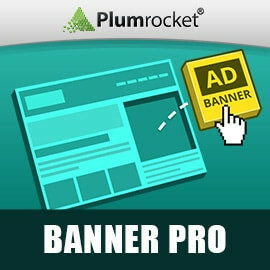 Brilliant marketing extension for creating banners! It has so many useful features! Great extension with many features if you are into marketing you will definitely need this. Only positive impressions so far! We have been waiting for such an extension to emerge on the market for quite a while. Now we got it from Plumrocket, and our company is currently testing it on our dev website, so far it's just amazing! We are creating our marketing campaigns right now for Xmas sales, and found the ajax functionality so handy and fast, fascinating. Our marketing department loves it, so Banner Pro is absolutely recommended for serious campaigns with Magento, as well as other platforms if you have 'em. Thanks Plumrocket, this extension is a King!